The United States Congress designated the Gros Ventre Wilderness (map) in 1984 and it now has a total of 285,607 acres. 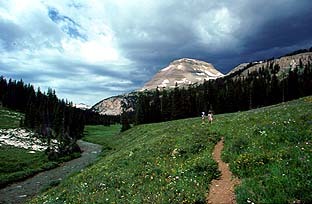 All of this wilderness is located in Wyoming and is managed by the Forest Service. The Gros Ventre Wilderness lies just east of Jackson in western Wyoming. The name "Gros Ventre" is French, meaning "big belly". It is roughly bounded by the Gros Ventre River to the north, the Green River to the east, the Hoback River to the south and the National Elk Refuge and Snake River to the west. The Gros Ventre Wilderness lies within the greater Yellowstone ecosystem, an area internationally known for its wildlands, wildlife, geological features, scenic beauty, and recreation opportunities. Key values leading to this area's designation are: ** Its outstanding habitat for important big game species including bighorn sheep, elk, deer, and black bear. Olaus Murie identified the Gros Ventre as essential calving ground for the Jackson Hole elk herd. Wolves, grizzly bears, mountain lions, and bison also call this wilderness home. ** Its spectacular geological features including a collage of colorful rocks and one of the largest concentrations of landslides. ** Its location between the Wind River Range and the National Elk Refuge and Grand Teton and Yellowstone National Parks provides important connections for wildlife. ** Its watershed values ** It is considered to be an excellent area for hunting, outfitting, and backpacking. When the sun sets in Jackson Hole, the last mountaintop to hold the dying alpenglow is the Sleeping Indian. The Indian is lying on his back and wearing a full warbonnet, effectively hiding from view the wild canyons and plateaus of the Gros Ventre Wilderness. The Gros Ventre is a landscape of contrasts - from big, lush meadows to steep pinnacles of limestone. The highest peak in Doubletop at 11,682 feet. Spectacular views of the Teton Range can be seen for virtually any high points. The Wilderness contains the headwaters of the Gros Ventre River as well as Granite Creek which is a major tributary to the Hoback River. The uplift which created the Gros Ventre Range began 50 million years ago. Folds and faults have produced a mountain range which is an asymmetrical arch, broken by faults. Its exposed strata are a bonanza for geologists. Evidence of landslides is abundant. In 1925, a landslide carried 50 million cubic yards of debris down Sheep Mountain forming a dam and creating Lower Slide Lake. Two years later a flood washed out part of this natural dam, destroying the town of Kelly. The slide area is now a National Geological Area within the Wilderness. A diverse variety of plant communities are found in the Gros Ventre. All have been shaped by past fire occurrence. Meadows range from wet sedge types to the drier grass and forb types. Forested stands range from those dominated by aspen, Douglas fir, or lodgepole pine to the higher elevation spruce-fir or whitebark pine communities. Alpine tundra extends from the upper limit of trees to the tops of the mountains. There is 10,000 years of human history and evidence of past uses can still be found in the wilderness including vision sites and wickiups. Each spring, small bands of Indians moved into Jackson Hole and hunted game in the mountains during the summer. In the 1800s, human uses continued to revolve around hunting game. Old cabins in the area are related to the fur trapper or "elk tuck" era. Hunting is also the basis for a long history of outfitting. Human livelihood is also evident in range cabins, drift fences and other structures associated with cattle and sheep grazing. Today, recreation is the dominant human use with the wilderness offering approximately 250 miles of trails to explore. "Outclassed by the visually more impressive Tetons, some 287 million years their junior, the rounded peaks, immensely gently sloping canyons, steep draws and gullies, and thick forest of the Gros Ventres convey a sense of age, a primeval quality" Jackson Hole Guide, August 7th, 1980. Planning to Visit the Gros Ventre Wilderness? How to follow the seven standard Leave No Trace principles differs in different parts of the country (desert vs. Rocky Mountains). Click on any of the principles listed below to learn more about how they apply in the Gros Ventre Wilderness.